Megan Nunes, Founder & CEO of Vinsight, shares her experiences at the Greater Vision Forum on October 3, 2018. 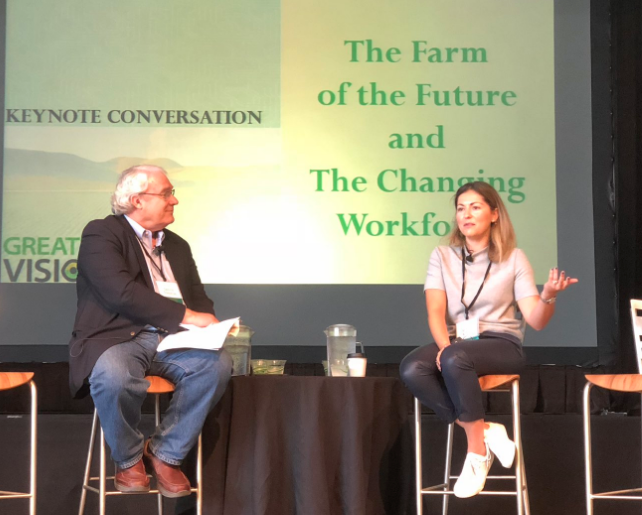 The event began with a keynote conversation entitled "The Farm of the Future and the Changing Workforce" by Dennis Donohue, Chairman, Grower-Shipper Association Foundation and Megan Nunes, Founder & CEO, Vinsight. The keynote conversation was followed by a panel entitled "Careers: Energy and Sustainability in Agriculture" and was led by Rosie Armstrong, Director of Workforce Development: Agriculture and Healthcare Sector Partnerships. Hartnell College. The panel included Alyson Blume, Lead UX Developer, Wexus Technologies; Chad Forrest, CFO, Concentric Power; and Alejandra Sanchez, Sustainability Manager, Taylor Farms. A final panel entitled "Careers: Technology in Agriculture" concluded the forum and addressed careers in new technologies needed on the farm. It was moderated by Abby Taylor-Silva, VP of Policy & Communications, Grower-Shipper Association and the panel included Jackie Vazquez, Director of Operations, Andrew and Williamson; Jennifer Skidgel-Clarke, Executive Director, California Leafy Greens Research Program; and Josh Ruiz, Director of Operations, Church Brothers Farms.